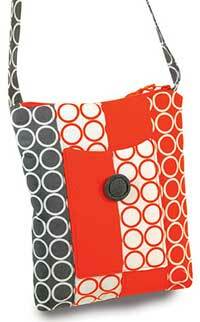 Sonoma Swing Bag Pattern - Retail $10 [PSB108] : Wholesale Purse Patterns, Purse Patterns at wholesale prices for quilting shops, craft stores, and fabric shops. Great class project for beginners. Learn to sew a zipper that is easy and professional looking and this pattern includes instructions for lots of pockets. Made with 5 jelly roll strips on the outside and 1/4 yard for lining.